Waikiki Shore is a remarkable high-rise condominium property located directly on the shore of the beautiful Waikiki Beach. As the only condominium complex with beachfront access, Waikiki Shore offers its residents breathtaking views of Diamond Head, beautiful sunsets, and the vast Pacific Ocean. Ideal for extended stays, Waikiki Shore keeps all of your living needs in mind, such as tasty restaurants, beach rentals, and boutique shops. Experience quality living at its finest, with the relaxing ambiance and resort-style amenities of Waikiki Shore available for all its residents to enjoy. With a diverse array of recreation in and around Waikiki Shore, residents and visitors alike will be impressed with fun activities and unique entertainment options. The most well-known beach, Waikiki Beach, is a beautiful stretch of white sand and clear waters that attract swimmers, snorkelers, and surfers to its sandy shores. 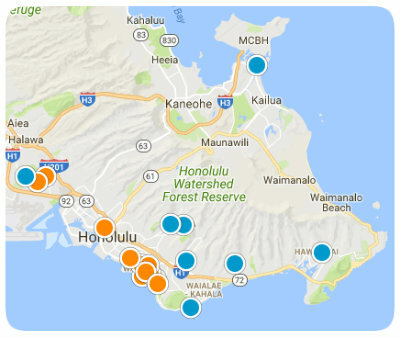 Within walking distance to Waikiki Shore are numerous other beaches, such as Queen’s Beach, Gray’s Beach, and Kuhio Beach. Residents of Waikiki Shore may choose to use the facility’s beach rentals, from kayaks to stand up paddleboards, which will enhance your beach experience. With local shopping, dining, and entertainment in Waikiki’s downtown district, residents enjoy easy access to these luxurious amenities and more. Waikiki Shore is the perfect real estate option for home buyers who desire direct beach access and love to spend lazy days soaking in the sun. Waikiki Shore offers its residents clean rooms and excellent services, with one and two-bedroom units available. This condominium property is fully furnished with couches, televisions, and beds, making your living experience one of ease and delight. Whether you choose to rent a condominium or buy a timeshare, Waikiki Shore will be sure to make your stay in Waikiki an unforgettable one. If you would like more information regarding condominiums for sale in Waikiki Shore, please allow us to assist you and contact us today.